Happy Friday y’all! I can’t tell you how nice it’s been to be at home in Dallas and not have any events or big plans this week. While I love doing events and going on fun trips, it’s a relief to have a few weeks off from travel so I can catch up on blog work, see my friends and get back into a routine. This weekend I’m looking forward to a bit of family time – my mom, stepdad and stepbrother are in town for the A&M game, so we’ll be going to that and grabbing dinner at a few of my favorite spots in Dallas. As I may have mentioned on the blog before, I’m not the best at buying jewelry for myself. I’m always much better at buying clothes than I am at accessories, so when Stephen Dweck reached out to me about wanting to send me a piece from his collection I jumped at the opportunity! His pieces are hand crafted in the USA, and always use the most luxe stones and minerals. This pair of earrings is my favorite, but I also love this rock crystal statement ring. 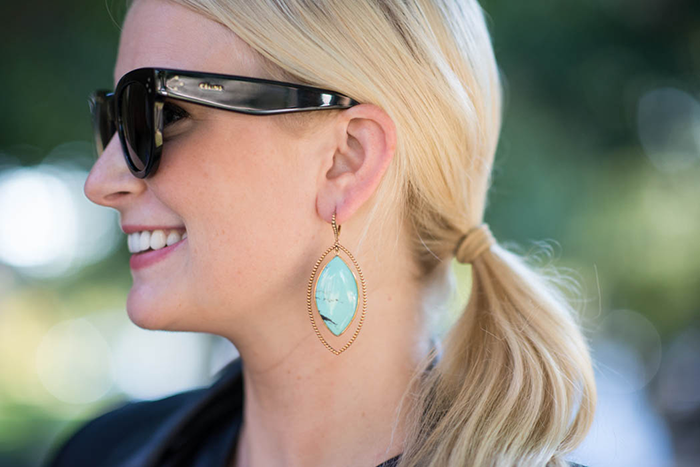 The turquoise earrings are a wonderful jewelry staple – turquoise goes with just about everything and works year-round in Texas. If you’re looking for something fall-specific, this ring and this pair of earrings have a rich, deep color scheme that’ll look fab against the autumn leaves. Shop more Stephen Dweck delicacies here! These pumps are everything and love those earrings as well. I am totally the same way about jewelry! I always depend on my mom to give it to me as a gift haha. But I am loving how you paired this crop top with this awesome skirt! Happy Friday! Love the earrings and the shoes! The print on that skirt is lovely! Look at you girl! Hot hot hot!! that top is everything! OMG, obsessed with it, and how you paired it with this midi skirt. Gorgeous. 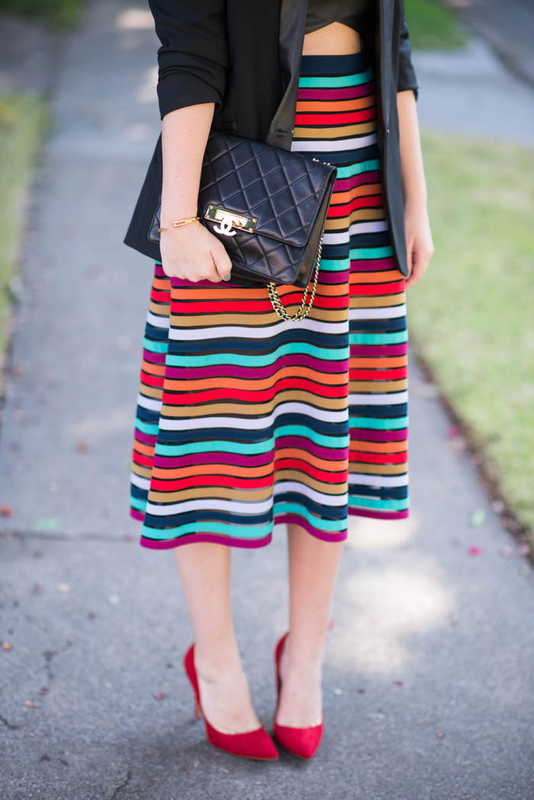 That’s such a fun skirt — and I love how you styled it! Perfect with a cropped top. The earrings are certainly gorgeous on you, and I am a huge fan of turquoise. Love this skirt as well, the stripes are so fun! Love those red heels and that gorgeous tuxedo blazer!!! Amazing look! So chic and stylish! Great pictures and stunning you! Adorable post! You look amazing in crops! Stephen Dweck is amazing, I met him at an event a few years back and have loved the story behind his pieces! Great designer! It’s fun to do the mid-drift top in Fall if it’s warm enough….so rebellious! You look awesome (as always)! So cute! Happy Friday Merritt! You look so stunning, this skirt is amazing. This skirt is so fun, such a great statement piece! Oh I totally understand that feeling of being so happy to be home (and be in one place) for a few weeks! So nice! Love this fall outfit, that skirt if beautiful! Hope you have a great weekend with your family. Love this top on you and that skirt! WOW! So fashionable! Love the combination and that skirt. Great statement piece. You look nice. Love the red shoes! What a beautiful look!!! You once wrote it was not your thing to wear crop tops but I think it’s perfect for you!! This top is so delicate and the colors of the skirt a nice change for all those fall colors now. Great!! I love the colors in those stripes, and that crop top is so pretty!